Crash! The window of an antique shoppe shatters as a 50-year-old mahogany chair comes hurtling through. A peek inside shows a pizza delivery boy with his fingers to his forehead. A lamp hovers over him. Suddenly, the lamp flies towards a little girl. Before it reaches her, it bursts into flames. Further inside the store, dark figures levitate grandfather clocks, musty armchairs, ceremonial daggers, and all manners of old-fashioned curiosities, sending them spinning through the air. It’s hard to make out the figures, but in the dim light you see a tiny robot’s eyes flash, and one woman’s laugh sounds straight from a jazz lounge. It’s just a few of your regular Joes duking it out telekinetic cage-match style. Welcome to Myr’s Antique Shoppe, where psychics fight for supremacy. This is Clairvoyance, a 2-5 player card game in which a battle of wits is literally a battle. Each player selects a different character with their own unique ability. Players draw cards, ready attacks, and send furniture flying at each other. May the best psychic win! Pick a character and place it in front of you. Put a health counter on the 10. Shuffle the deck and deal 5 cards to each player. Each player says a number from 1 to 8. Roll the die. Whoever guessed the face the die lands on goes first. If no one guessed correctly, roll again. Place the die in front of the first player, with that face up. Turn order goes clockwise. Pass the die to the next player to indicate whose turn it is. You win when all other players have 0 (or less) health. When a player loses all their health, they discard their hand and possessed items (see possession) and are now out of the game. On your turn you can take up to 2 actions. If there are more than 2 players currently in the game, or if you started the game with just 2 players, then only 1 of these actions may be throwing an item. Possess an item or put an item into another player’s possession. Throw an item from your hand. Discard up to 2 cards. After you finish taking actions, draw up to your max hand size of 5 cards. If at any time the deck run out of cards, replenish it with the shuffled discard pile. At any point in the game, you may use character abilities, utilize single-use item’s effects, or play instant cards from your hand for no action cost. Whenever you play an item card from your hand, reveal the card and declare your intention to throw the item or to put it into your or another player’s possession. Other players now have a chance to interfere by playing instant cards, activating single-use abilities, or using character abilities. Once everyone who wants to interfere has done so, you must then turn the die along 1 of the 3 edges to an adjacent face. (You will only ever turn the die more or less than 1 face if directed to do so by a card or character ability). Gertrude takes an Armchair from her hand to throw at RX-97. To activate the card, she must get the die to show a 6 or a 1. The die currently displays a 3 face-up. Gertrude looks at the 3 faces adjacent to the 3 and see 2, 6, and 4. She turns the die so the 6 faces up. This activates the Armchair and it hits RX-97, dealing it damage. If the number on the displayed face matches one of the card’s activation faces, the card succeeds in being played. If the number does not match, discard the card. You must still turn the die, even if you cannot make it show the needed activation face. This unsuccessful attempt to throw or possess the card still counts as using an action. An item becomes possessed when you take it from your hand and place it in front of yourself or another player. The possessed item stays on the table. Whomever the card is placed in front of (regardless of who placed it) owns the card, and can use its ability or throw it. You may have up to 3 possessed items. If at any time you would gain a 4th, you must first discard one of your existing 3 possessed items. To attempt to throw an item, select one of your items (possessed or in your hand), and choose a player as your target. Once you have declared your intention to throw a possessed item, it is no longer considered possessed. Players (including the current player) have a chance to interfere with your throw by activating their possessed items’ single-use effects or by playing instant cards. If you throw an item from your hand, then after players have had a chance to interfere with the throw, you must turn the die. If this fails to reveal one of the item’s activation faces, then the throw fails and no damage is dealt. If your throw successfully lands, the targeted player is dealt the amount of damage indicated on the item card. If you thrown an item from your collection of possessed items, do not turn the die; the throw automatically succeeds. However, players may still interfere to reduce how much damage is dealt. After anyone who would like to interferes does so, the targeted player takes the remaining damage. Normally, you may only throw 1 item during your turn. However, the moment the number of players in the game is reduced to 2, even if this happens mid-turn, any number of your actions may be throws. (Note that if you started with 2 players this does not apply). Items are cards you can possess or throw from your hand. Some items have effects that are either single-use or continuous. You may either utilize a single-use item’s effect or throw the item. After either, discard the card. To use the effect, first possess the card. You may then use the single-use effect at any time, without using an action or turning the die. Claire already possesses Music Box. 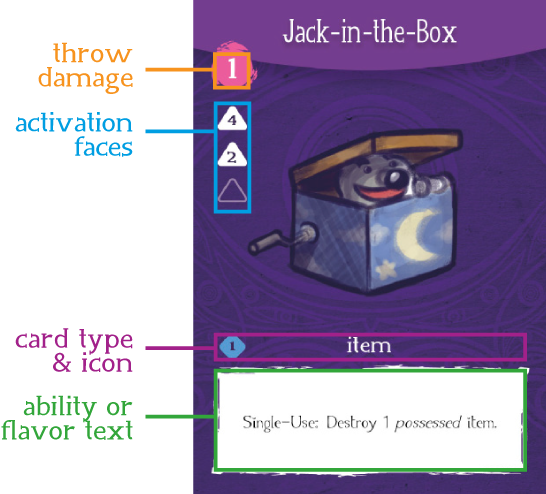 Harold uses the effect from Jack-in-the-Box, a single-use item he has possessed, to destroy Music Box. Harold then discards Jack-in-the-Box. An item marked with a continuous symbol is not discarded after its effect is used (unless the card says otherwise). The effect can occur more than once. Continuous effects are not optional. It is possible that 2 or more players will try to play an item or instant, activate a single use ability, or activate a character ability at the same time that another player is trying to do one of these things. Should this happen, the person closest to the left of the turn-holder gets to have their move take place first. Once that player’s move is resolved, the next player (going in turn order) chooses to either follow through with their originally intended move or withdraw it. If a player withdraws their intended move, the card that would have been activated is returned to its original location and/or the ability is considered not to have been used. Instant cards may be played at any time (including others’ turns) and their effects are resolved immediately. Discard an instant card after use. Playing an instant does not use up an action. Sebastian announces he’s throwing a Lamp at Mama Rita, which will do 2 damage. Mama Rita plays Pyrokinesis, an instant, to destroy the Lamp. Sebastian still turns the die 1 face. Each character has a unique ability that can be used once per game at any time. When a player declares they are using the ability, it immediately takes effect, and the current player must pause their turn to allow anyone to respond to it. Mama Rita is your one-and-only psychic phone service, direct from Earth to the hereafter and beyond. Care to find out what secrets old great-grandma had? No? How about Lincoln? Gandhi? Cleopatra? These and any figure of the past, big or small, can be yours to call with the help of Mama Rita, the world's greatest medium and spiritual contact specialist! For a small fee, Mama Rita can set you up with a direct line to the deceased person of your choosing, and will be on hand should the call become less informational and more spectral possession. All sales, and clients, final. Charges Apply: Take 1 possessed item from any player and put it into a different player’s possession. Gertrude never wanted to be a psychic. She never wanted to burn down the orphanage either. Shadow did though. Miss Gertrude Patricia Sloan was born Friday, October 13 under a blood moon and a fortuitous alignment of the planets, gifting her with the amazing ability to be quite terribly unfortunate. While other girls her age were learning the rhymes to jump rope, Gertrude was trying to convince Shadow that everything was just fine the way it was, not on fire. If you hadn't guessed, Shadow is a tough sell. Gertrude still tries though. Harold believes the key to great service is knowing what your customer wants, as soon as they think it. Have you ever had a hankering for pizza and gone to the phone, only to hear a ring at the doorbell and see a pizza boy standing there with exactly what you would have ordered? No? Well, you must live outside Harold's route, which is a shame. Really, you're missing out. 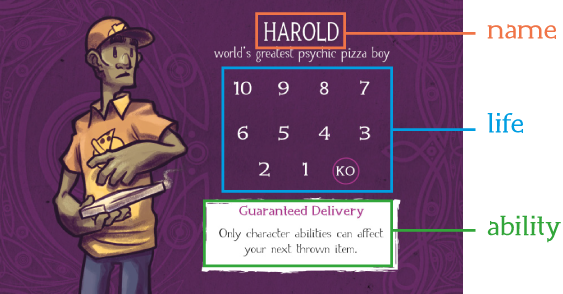 There are, no doubt, many pizza delivery legends, but Harold is the greatest. Guaranteed Delivery: Only character abilities can affect your next thrown item. Hobo. Street Prophet. Possible Wizard. Ed’s seen the future, read the lifelines in the sidewalk cracks, read the love lines in the tread marks left by wet sneakers, watched how the pennies fall. If he looks strange wearing a banana rind under his nose, know that it’s only to keep aliens from sliding up his nostrils and into his brain. He knows when Atlantis will rise to take back the world and he knows when they’ll fix that pothole on Fountain Street. One’s coming too soon, the other not soon enough. Forget your momma’s back, it’s the future breaking like so many sidewalk cracks. It’s written between the letters of the road signs. When will the world end? Yesterday. Tell your children. Time’s ill, in bed with the flu, and we’re all paying through the nose in paradoxes. Don’t believe him? The government does. Men in black jackets pour spy-cams into his coin cup. Of course we’re being spied on; think real buskers sound that good? Check out the dollar bills, see how George Washington’s eyes follow you as you twitch. Scrounge: Take 1 card from the discard pile and put it into your hand. This little robot is the hottest toy your child never wanted. RX-97’s sound effects include shrieks and moans that sound just like it’s possessed by a malevolent spirit, and its claws grip with an unearthly force! RX-97 comes without batteries, but that's okay, it runs on the most eco-friendly fuel of all: fear and nightmares! RX-97’s eyes glow and alternate colors, so you can know when it’s coming around the corner to get you. With so many features, RX-97 always has new ways to keep playing and playing and playing, even long after your child wants to stop. You may be wondering, "how can I get away?" Oops, you can't! Instead try wondering, "how can I best help RX-97 plunge the world into darkness?" Circuit Breaker: Change the target of the current thrown item. Curator of antiques and organizer of psychic competitions, Myr is a… shopkeeper of many talents. A long-time supporter of the local practitioners of the aetheric arts, Myr gathers fellow psychics to his store, Myr’s Antique Shoppe, where, during the day, he sells nearly curse-free curiosities for curiously-good prices. Since all the participants at his competitions are psychic, there tends to be a lot of property damage and what could be called spontaneous arson. It's okay though, there are always plenty more curiosities in the shoppe. It may seem strange, but it's tradition. Eminent Domain: Search through the deck and put 1 item into your hand. Then shuffle the deck. Sebastian runs a successful business as an "aetherial romantic coordinator" or just a ghost dating service if you're boorish about it. Sebastian can hook you (the ghoul, spirit, or apparition with a desire for earthly contact) up with the perfect host, guaranteed to suit your ectoplasmic tastes. For the discerning human, perhaps you want to know what kind of benefit you can get. How does unearthly power sound? For a small transaction of time as a vessel, you too can have that power. Whether you're looking for some precognition, prognosticatin’, or a snappy tune, Claire's your gal. Not every psychic can support herself on her aetheric gifts entirely. Luckily, Claire has the kind of pipes that bring a house down and fill the soul with joy or sadness at the drop of a note. Some of her lyrics are oddly audience-specific and her choruses repeat some truths better left unspoken, but at least they sound nice. Prognosticate: Set the die on any face. In a 2 player game, you can only throw 1 item each turn. When determining first player, each player picks 2 numbers instead of 1. Players can form teams. Make sure each team has an equal amount of players, and sit across from your teammate. The only difference in play is that your team wins when all other teams’ players have 0 health.